It was a Friday night, past 9 PM when sissy and I decided to eat outside. 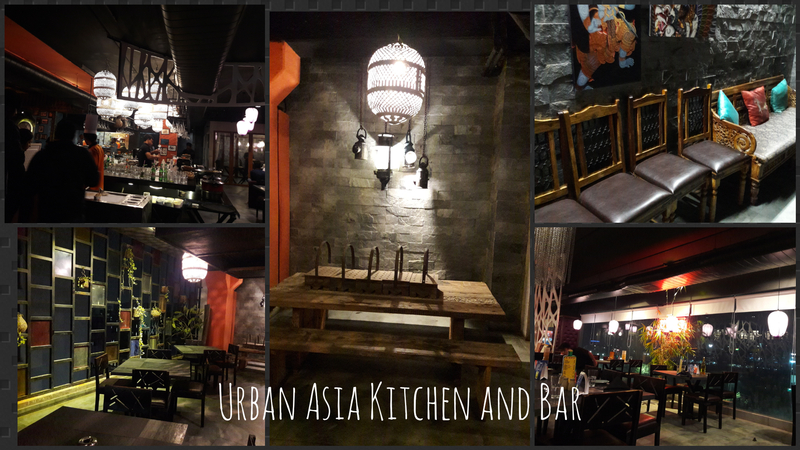 I was planning to visit Urban Asia from the day I found it out in Gachibowli, Hyderabad but every time a different restaurant got the priority. I opened zomato and booked a table for 2 ’cause who wants to be turned down because of rush? The location is quite easy to find out and we showed up in time. The same building has many other restaurants such as Pot Pourri, Bahar Cafe, Cibo House, Eat India Company, Tiki Shack Roof top Bar and so on. As I understood, Eat India Company, Urban Asia and Tiki Shack are owned by the same people. In fact the entrance is same for all, they only differ by menu. Urban Asia as the name suggests is for Asian cuisines and alcoholic beverages while on the other hand Eat India Company is for Indian food. Going to Urban Asia and opting for Buffet offering only Indian food would be the stupidest decision ever taken by me, except the fact that I wanted have some drinks as well. We found the buffet menu in their zomaro account as TDH buffet menu. Now one of the problem that I see with buffet is some restaurants don’t really give the printed menu for buffet, they serve different things on different day of the week. So you don’t really know what to expect. For Urban Asia, I assumed that we were served the TDH buffet menu that was there in zomato. As soon as I showed the menu to the waiter, he said that it was for only for selective days. There was no such mention in the website and I felt a little skeptical. We were served with veg galouti kebab (a soft kebab that will melt in your mouth), crispy potato (cousin of french fries), batter fried veggies, tandoori paneer. Quality and taste wise, the veg starters were quite fine. in staples they had pretty much everything same except there was veg fried rice as well. In Main course there were one chicken curry, one mutton gravy (different from the menu), daal bukhara, palak paneer, mutton biriyani, thai curry. In dessert there were 4 basic flavours of ice-creams and mini pastries, brownies, tart, phirni. The main course was okayish, I liked the mutton gravy among all. The dessert was just average, the brownies were dry and tasteless. Overall, the taste and variety is average I would say. The ambiance is nice, it’s a good place for dining out with family. The service was quite swift. The total meal cost around 1300 Rs. for 2. There is one thing I was disappointed about the visit. I ordered one drink from the menu and asked for it for more than 3 times but everytime the waiter would vanish after that. I have never been in a situation like this before. In the worst case the restaurant admits that they don’t have the particular item available. But these guys did not tell me anything and neither did they serve the drink. I saw that in the other tables they have served the drinks. I just don’t understand why and how a restaurant has such poor service. First of all, there is no clarity about the buffet menu. Secondly, they ignored one of the orders without any reason. I would probably visit them one last time to try out the Asian menu as that is the specialty and I would update if I see any difference in the service next time.